Holmes County is a county located in the U.S. state of Ohio. As of the 2010 census, the population was 42,366. Its county seat is Millersburg. The county was formed in 1824 from portions of Coshocton, Tuscarawas and Wayne counties and organized the following year. It was named after Andrew Holmes, an officer killed in the War of 1812. A large Amish community of about 36,000 exists in Northeast-Central Ohio, centered on Holmes County and extending into surrounding counties. Holmes County houses the highest percentage of Amish of any U.S. county, currently 42 percent of the population, and experts speculate that within 15 years Holmes County may be the first majority Amish county. The overall Amish population of the area, centered on Holmes County, is the largest Amish community in the world. Called locally "Amish Country", it draws many visitors to the county thus making tourism an important sector of the local economy. According to the U.S. Census Bureau, the county has a total area of 424 square miles (1,100 km2), of which 423 square miles (1,100 km2) is land and 1.4 square miles (3.6 km2) (0.3%) is water. As of the census of 2000, there were 38,943 people, 11,337 households, and 9,194 families residing in the county. The population density was 92 people per square mile (36/km²). There were 12,280 housing units at an average density of 29 per square mile (11/km²). The racial makeup of the county was 99.03% White, 0.33% Black or African American, 0.06% Native American, 0.06% Asian, 0.01% Pacific Islander, 0.13% from other races, and 0.40% from two or more races. Hispanic or Latino of any race were 0.75% of the population. 56.1% spoke English, 20.1% Pennsylvania German, 15.8% German and 7.1% "Dutch" as their first language. There were 11,337 households out of which 44.30% had children under the age of 18 living with them, 71.50% were married couples living together, 6.50% had a female householder with no husband present, and 18.90% were non-families. 16.10% of all households were made up of individuals and 6.90% had someone living alone who was 65 years of age or older. The average household size was 3.35 and the average family size was 3.82. Religious breakdown for those who gave a religion (68.33 of the total population) was 89.79% Evangelical Protestant, 8.04% Mainline Protestant and 2.16% Catholic. There were 140 Amish congregations with 17,654 adherents. There were several other unrelated Amish congregations and Mennonite congregations. There was one Catholic congregation. In the county, the population was spread out with 35.60% under the age of 18, 10.40% from 18 to 24, 25.70% from 25 to 44, 17.80% from 45 to 64, and 10.50% who were 65 years of age or older. The median age was 28 years. For every 100 females there were 99.60 males. For every 100 females age 18 and over, there were 95.50 males. The median income for a household in the county was $36,944, and the median income for a family was $40,230. Males had a median income of $28,490 versus $20,602 for females. The per capita income for the county was $14,197. About 10.50% of families and 12.90% of the population were below the poverty line, including 17.40% of those under age 18 and 13.30% of those age 65 or over. Holmes County has a relatively high number of residents who do not speak English at home. According to the 2000 census, almost 36% of the population speak either Pennsylvania Dutch or German at home, and a further 7% speak Dutch. 42.92% of the total population and 50.28% of the children in 5-17 age range uses German/Pennsylvania German or Dutch at home. ^ a b "State & County QuickFacts". United States Census Bureau. http://quickfacts.census.gov/qfd/states/39/39075.html. Retrieved February 8, 2015. ^ Gannett, Henry (1905). The Origin of Certain Place Names in the United States. Govt. Print. Off.. pp. 159. http://books.google.com/books?id=9V1IAAAAMAAJ&pg=PA159#v=onepage&q&f=false. 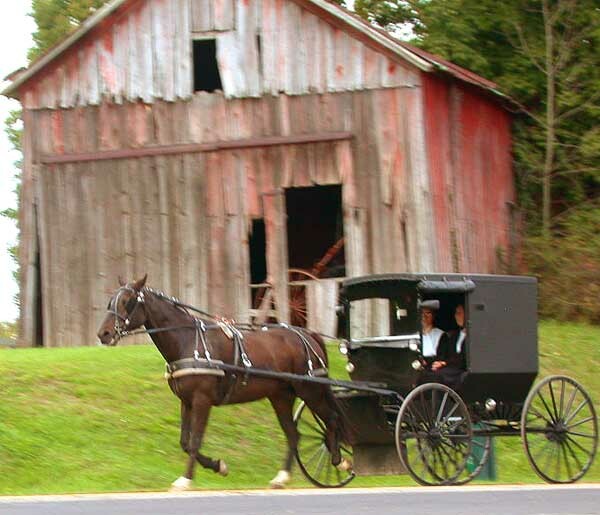 ^ a b "Fact Sheets: Holmes County and Amish Country". Holmes County Chamber of Commerce. http://holmescountychamber.com/press_factsheets.php?ID=14. Retrieved July 29, 2012. . Quote: "Approximately 36,000 Amish residents make the region the largest Amish community in the world. Centered in Holmes County, Amish Country extends into each of the surrounding five counties. The Amish community has existed in this region of Ohio since 1809." ^ "Estimate: A New Amish Community is Founded Every 3 1/2 Weeks in U.S.". The Ohio State University. http://researchnews.osu.edu/archive/amishpop.htm. Retrieved 2013-06-17. . Quote: "“My guess is that in 15 years, we’ll witness a county whose population is majority Amish, and Holmes County is likely to gain that distinction first. Perhaps LaGrange County in Indiana will not be far behind,” Donnermeyer said." ^ "2010 Census Gazetteer Files". United States Census Bureau. August 22, 2012. http://www.census.gov/geo/maps-data/data/docs/gazetteer/counties_list_39.txt. Retrieved February 8, 2015. ^ "U.S. Decennial Census". United States Census Bureau. http://www.census.gov/prod/www/decennial.html. Retrieved February 8, 2015. ^ "Historical Census Browser". University of Virginia Library. http://mapserver.lib.virginia.edu. Retrieved February 8, 2015. ^ Forstall, Richard L., ed (March 27, 1995). "Population of Counties by Decennial Census: 1900 to 1990". United States Census Bureau. http://www.census.gov/population/cencounts/oh190090.txt. Retrieved February 8, 2015. ^ "Census 2000 PHC-T-4. Ranking Tables for Counties: 1990 and 2000". United States Census Bureau. April 2, 2001. http://www.census.gov/population/www/cen2000/briefs/phc-t4/tables/tab02.pdf. Retrieved February 8, 2015. This page uses content from the English language Wikipedia. The original content was at Holmes County, Ohio. The list of authors can be seen in the page history. As with this Familypedia wiki, the content of Wikipedia is available under the Creative Commons License.